How did an ancient obelisk get to Central Park? 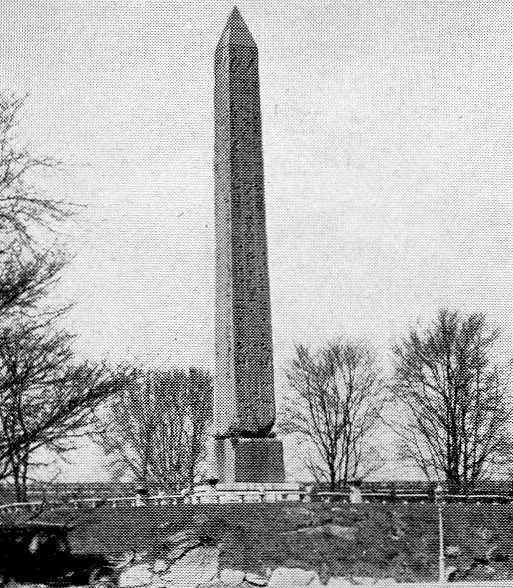 Below is a 1920 photograph of Cleopatra’s Needle, the nickname for the 68-foot ancient Egyptian obelisk that has stood off of about East 80th Street in Central Park since 1881. With its hieroglyphics and inscriptions, the obelisk is majestic and mysterious. Its presence in the park begs the question: who brought it here, and why? Turns out it was offered to the United States in 1869 as a gift from an Egyptian leader who wanted to cultivate trade between the two nations. It’s part of a pair; the other obelisk was given to London. 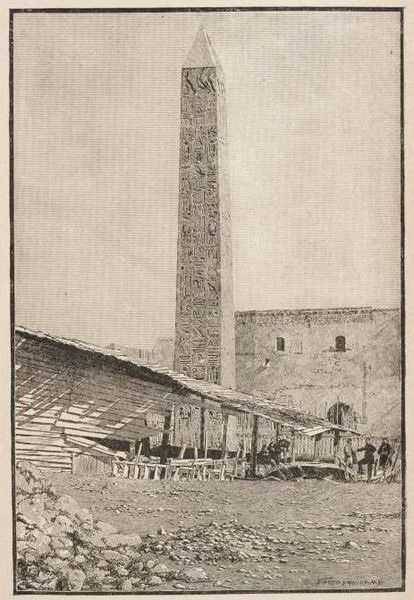 The US-bound obelisk stayed in Egypt until railroad titan and New Yorker William K. Vanderbilt put up the dough to bring it across the Atlantic and assemble it in Central Park. That was a delicate task. The granite monument weighed almost 250 tons. It took 32 horses to move just the pedestal from the Hudson River pier to Fifth Avenue. A special trestle had to be built to bring it from Fifth Avenue to the park. And despite it’s name, it has nothing to do with Cleopatra. The obelisk was built more than 3,000 years ago, predating her existence. Here’s Cleopatra’s Needle in Alexandria, Egypt, before being shipped to Central Park. It may be the oldest object in New York City, charming and perplexing park-goers for over a century. This entry was posted on April 1, 2009 at 3:53 am and is filed under central park, Music, art, theater. You can follow any responses to this entry through the RSS 2.0 feed. You can leave a response, or trackback from your own site. the metropolitan museum publishes a nicely illustrated, reasonably priced booklet about this. iirc, the surface has been more deteriorated in one century in nyc than in the previous 30 centuries in egypt, so it’s good someone copied the text! Dr. Zahi HawassZahi Hawass the Secretary-General of the Supreme Council of Antiquities in Egypt threatened the recovery of the Egyptian obelisk in New York City since the nineteenth century, if the city did not take serious steps to repair the devastating effects caused to them. Zahi Hawass said in a letter sent last week to New York Mayor Michael Bloomberg said that the stone obelisk severely eroded due to fluctuation of weather conditions during the last century without any effort to preserve it. Hawass, saying that he has a responsibility to protect all Egyptian antiquities, whether inside or outside the country, pointing out that the hieroglyphs had completely deleted from the place, and warning that if the Commission for the Conservation of New York City, can not provide the necessary protection of the obelisk, he will take the necessary steps to restore these precious artifact to save it from destruction. Hawass said: they have the opportunity to work three months to necessary repairs. In response, Jonathan CohenJonathan Cohen, Director of the Art Department of Archaeology of Gardens New York was considered that there was no evidence of serious erosion of the right of continuous Bamuslp Egypt, stressing that the study of the Metropolitan Museum in the eighties I found stated that the granite was idle to a large extent, and that the damage to the inscriptions and the base effect occurred in the distant past. Cohen added that we are working in recent years with the Metropolitan Museum and the maintenance of Central Park – for further analysis and monitoring the state of the obelisk, while the representatives of the mayor’s rejected to comment. The date of construction of the obelisk, which stands at 6, 21 meters to 2053 almost a year, and there is another only one like this obelisk in the British capital London.